You’ve seen them at many a busy Houston intersection. Those ubiquitous 20-something street hawkers with the athleticism and endurance to toss around a skinny six-by-two foot arrow-shaped sign for hours under the blazing sun. Their moves — or “tricks” — are meant to draw attention to new subdivisions, apartment complexes, tax preparers and furniture stores having a big sale. With their wide smiles and chirpy expressions, sign spinners feed off their audience: drivers and pedestrians who will sometimes offer up a bottle of water, Gatorade or even a cash tip. Ten of Houston’s best spinners employed by AArrow Advertising are in Las Vegas for the company’s 10th annual World Sign Spinning Championships. 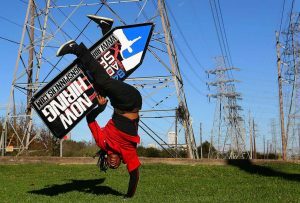 The two-day event will showcase 100 AArrow sign spinners from around the world competing for a chance at winning a $5,000 first place prize. Click play on the 360-degree video below to watch three Houston spinners show off some of their moves before the competition. PreviousPrevious post:The Las Vegas Review Journal Covers WSSCX!NextNext post:Houston Spinner Ray Rivera, comes home with 3rd Place Metal at WSSCX!